Texas, being a large state has a variety of regions to visit and explore. Each region will be beautiful in its own way and will present its own issues that will need to be overcome to adventure there. I will cover the different regions using the Omernik level III ecoregions. This system was developed in 1987 by (you guessed it) Omernik. The system has been adopted by the EPA and other governmental Agencies. The Arizona/New Mexico Mountain Region barely enters Texas, but it is present nonetheless. These mountains have lower elevation than surrounding mountains and have vegetation present from drier climates. The Guadalupe Mountains National Park is found in this region. This region is slightly lower in elevation than the neighboring high plains. In addition, it receives a little more rain as well. The region is mostly croplands now, but was once grasslands with scattered trees and shrubs. Lake Arrowhead State Park is found in this region, which contains a lake and a few hiking trails. This region is the southernmost desert in the United States and extends approximately 500 miles into Mexico. The vegetation here is mainly desert grassland and shrubland; however, at higher elevation oak, pine, and juniper can be found. Big Bend National Park can be found in this region, which is one of my favorite parks. This region extends from the hills of Oklahoma. The natural vegetation is old growth oak and cedar trees. In addition, the region is mostly comprised of rangelands and pastures. Possum Kingdom State Park is found in this region, which contains a large lake. The central plains have clay soil and are irregular plains. In addition, the vegetation is that of open prairie with much of the region used as rangelands and pasture. This region has Bastrop State Park, which has scenic hikes and bike rides through the pines. In addition, I went to the Boy Scout camp Lost Pines many times as a child, which is very close to the Bastrop State Park. 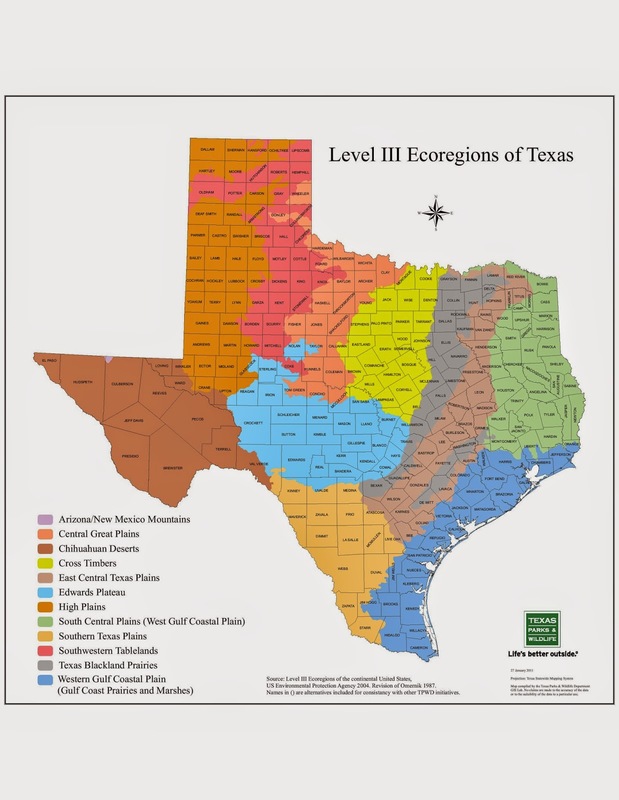 This region is known to be hiller than other areas in Texas. In addition, it is a limestone plateau and distinguished from neighboring regions by a fault line. Furthermore, the region contains a network of creeks. Finally, the region is used for grazing cattle and other herd animals. Lost Maples State Park is in the region, which has beautiful leaves during autumn. This region is higher and drier than the neighboring central plains. In addition, this region is smooth plains with a large portion used for crops. Furthermore, the region has a variety of native grasses. Palo Alto State park is in this region, which contains the United States Second largest canyon (second to the Grand Canyon). This region is in east Texas and has a significant amount of pines and other coniferous trees. Locally, the area is known as “piney woods”. The region contains very little cropland, but is a site for lumber. This region contains Texas’s longest continuing hiking trail, The Lone Star Hiking Trail at 129 miles. This region has rolling hills and extends into Mexico. The area was once grasslands, but has slowly been taken over by the mesquite tree. The area is known locally as “brushlands”. The region is dry but has unique plants and animals worth checking out. The Kickapoo Cavern State Park is found in this region and has a variety of activities: hiking, camping, biking, and caving. The Southwestern Tablelands contain canyons, mesas, and badlands, which are separated by rivers. The area has very little cropland as it is semiarid, and contains vegetation similar to other semiarid regions in Texas. The Caprock Canyons State Park & Trailway is found in this region. This park is another that has a variety of activities including hiking, biking, and a new herd of bison. The Texas Blackland Prairies are nearly level and have a mix of grasses. In addition, this region has a higher proportion of croplands than neighboring regions. Furthermore, the region is being converted to urban and industrial uses. Bonham State Park is found in this region, which contains a small lake and a variety of outdoor activities. This region is flat, humid, and mainly grasslands. However, the further inland in you travel, the more hills and forest are found. Furthermore, this region provides access to the Gulf of Mexico. This region is also being urbanized quickly. The Matagorda Island Wildlife Management Area is found in this region. This park is also, where I am planning my next multiday adventure. The island is secluded and is a great location to backpack and mountain bike.